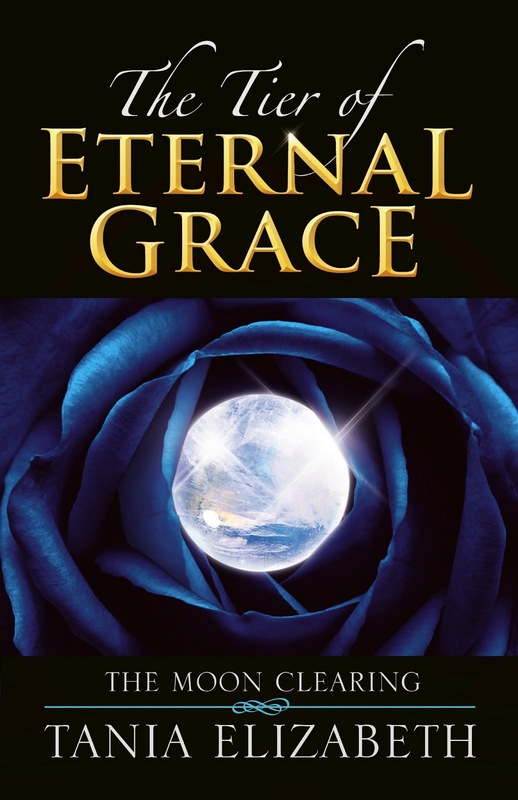 Tania Elizabeth is a mother first and foremost and the author of The Tier of Eternal Grace. Book One The Moon Clearing was released earlier this year. Book Two The Mirror’s Shadow will be released about September. Book Three will then follow in the early part of 2014. 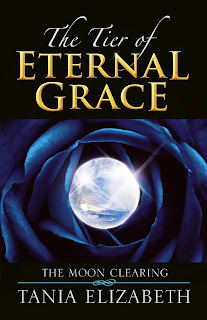 The Tier of Eternal Grace is a captivating fantasy of magic and passion, wound into the truths of reality that will enchant readers with its depiction of the faerie realm, and the exploits of the faeries themselves. Book One of the series The Moon Clearing is an immersive tale of mysticism and adventure, of spiritual and sensual intent that shall enrapture your every sense. Beyond the boundary that separates the mundane and earthly planes from the divine lies Eterna Fadas, a place ruled by extraordinary beings, lithe and human-like in appearance, yet ethereal in their grace and beauty, and sensuous in nature. "I have existed always! Where I began I do not know, for all I know is just as I am today!" As Queen, Tatiana was thought to have lived a life of opulence, her faith and beliefs her endearing essence. Why then was it so, that beneath the picture of perfection laid torments and terrors even she dare not explain. Being She came with its prices paid. Being She came with a deal; a contract in which she was to relinquish herself to a rogue of unmerciful fury. Would this be the end of all she know? Would this be the end of her existence? Aside from her writing and her three angels, Tania is also an advocate for the Starlight Children’s Foundation. Being a mother herself and having seen firsthand what some of these children are dealt with on a day to day basis, and yet seeing the strength and courage they each maintain, Tania felt the need to not only donate her time, but to also help raise much needed funds. The Starlight Children’s Foundation transforms the experience of hospitalization and treatment for seriously ill children and their families. Starlight is the only children’s charity with a permanent, physical presence in very major pediatric hospital in the country. Every minute of every day a child is admitted to hospital in Australia. For thousands of these children what happens next is the diagnosis of a serious or chronic illness that changes their life, and the lives of their families, forever. This is where Starlight steps in - delivering a range of innovative programs, built on the World Health Organization’s social model of health, to support the well-being and resilience of these seriously ill children and their families. Like each and every one of us, Tania's own journey has been one of trials and tribulations, of Love and of passions; and the dissolutions of it. Heartache, sorrows, smiles and laughter always seeming. Through the writing of this book and the words of Tatiana, Tania has found a peace within and learnt the true meaning of "I LOVE ME!" I am asking for all’s assistance. To give to others is to give to oneself, and I NEED YOUR HELP!!! Help us to raise funds for the Starlight Children's Foundation, which supports terminally ill children and their families. There are two ways in which people can help. By simply hosting, reviewing or interviewing myself/my book via a blog post, amazon, newspaper, radio, TV within a 21day window frame, between the dates of Friday 12th of April and Friday the 3rd of May. For every appearance, I will be donating $1 to the Starlight Children’s Foundation. If any of you could help, I would be so grateful. If you could connect me with anyone else who would be happy to interview, do a short post or review on myself/my book, I would be ever so grateful more. I am also asking for donations, even $1, which you may do direct via this link. You may also follow our progress on the Starlight Author's Aid Facebook Page. We are looking at making this an annual event. This year it is based upon myself, though every year after, we will base it upon another upcoming author. So please share and pass this along to all. Let's make this a huge affair and raise much needed funds for a very worthy cause. 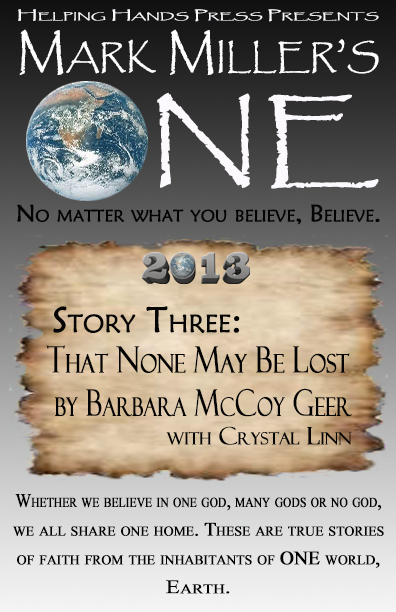 Volume 3 of the 2013 series of One comes from our friend Crystal Linn and Barbara Geer McCoy. A portion of the author’s proceeds will be donated to World Concern, a Christian global relief and development organization. World Concern’s efforts reach deep into the most remote corners of the planet, where climate and geography, societal instability and scarce infrastructure create incredible challenges to the people living there, including disaster response, clean water, education, food security, child protection, microfinance and health. Visit WorldConcern.org for more information. The series creators and publisher are in no other way affiliated with this organization. 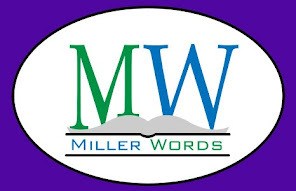 Mark Miller’s One 2013 is a spiritual anthology examining True-Life experiences of Authors and their Faith. As the series evolves expect to discover what it means to have faith, no matter what that faith is and no matter where they live. Remember that we are all part of this One World. 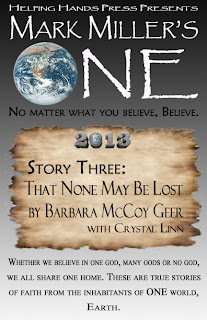 Story Three begins in the late 1950s as Jim McCoy, a pharmacist, and his wife, Barbara (Kenoyer) McCoy, a pharmacy technician, joined forces with several doctors and local businesses to start an organization to stop waste and to help the less fortunate. As a team, they collected leftover pharmaceutical samples and over-the-counter drugs, along with other health related products and bundled them in large shipping barrels, cushioning the items with blankets and baby clothes. These barrels where then shipped overseas to the mission fields. Here is a fond retelling of the story of World Concern. A vital organization that is committed to serving the world were it is needed most. As a first time author, Ms. McCoy delivers glimpses into major and minor events of the organizations history almost as if we were looking at her memories. The gentle flow from one encounter to the next makes this a touching memoir. Also on Nook and Kobo.